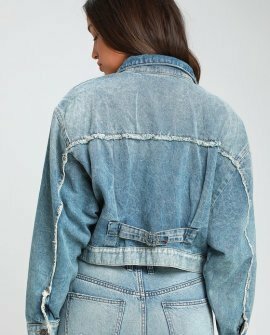 The Free People Bedford Medium Wash Distressed Cropped Denim Jacket is the perfect addition to any casual day look! 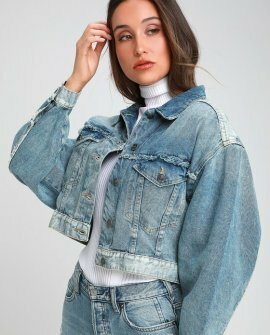 Perfectly lived-in and distressed denim shapes a cute, cropped, and retro-inspired silhouette, complete with a collared neckline, and front patch pockets. Wide-cut sleeves, a full button placket, and adjustable belt at back lend trendy finishing details.